B Italia broke County Down hearts to win the SuperCupNI Premier section, with two astonishing goals. Salvatore Kevin Buonavoglia’s stylish finish and Marco Bingo’s outrageous long-range volley settled the game in B Italia’s favour, with John Bailie’s county side unable to stop the classy Europeans from winning the prestigious youth tournament. B Italia is a select team made up of young players who are contracted to clubs outside of Serie A. A disappointed Down manager John Bailie said, “I’m very proud of the boys and what they have achieved this week. “The only disappointment for me was that we didn’t show people what we are capable of in the final. You can make excuses and say we were tired but it was the same for both teams. “The Italia boys showed up and we didn’t. We didn’t hit the levels that we reached during the week. “Credit to Italia, they fully deserved to win. They were a physical team, strong in the tackle and good in the air. We struggled to deal with that at times. The Italians took a deserved lead in the 17th minute, when Salvatore Kevin Buonavoglia scored a contender for goal of the tournament. Buonavolgia burst through the Down defence at pace before hitting a sweet shot with the outside of his right book, that gave Dylan Stewart in the Down goal no chance. Nicola Bariol almost doubled the Italians’ advantage on the half hour mark. After a goalmouth scramble, his effort was cleared off the line by Mal Smith. Down had a good shout for a penalty turned down by referee Tony Clarke just before half-time, when substitute Ben Cushnie was clattered by goalkeeper Federico La Rosa. 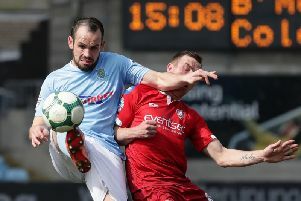 Ruari O’Hare was fortunate not to receive a red cad in the 53rd minute, when the Down defender crunched into Christian Cerretti. Clarke opted for a yellow card, much to the dismay of the Italians. Marco Bingo settled the game in the 60th minute when an outrageous 25-yard volley that nearly broke the net. Bingo’s strike was enough to seal the cup for the Italians despite Down’s late efforts to get back into the game. While Down will be disappointed with their performance on the night they can take a massive amount of pride in their displays over the course of the week. With Antrim winning the Junior section, it’s clear that the county teams are now a force to be reckoned with at the SuperCupNI.